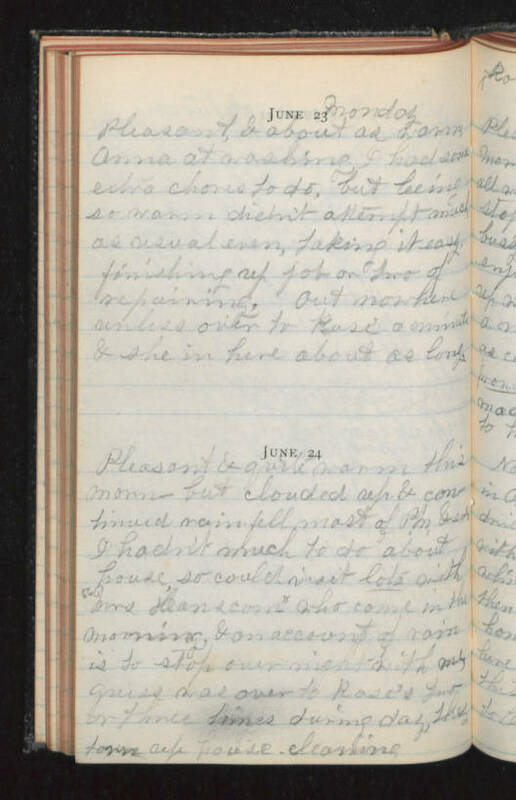 June 23 Monday Pleasant, & about as warm - Anna at washing, I had some extra chores to do, but being so warm didn't attempt much as usual even, taking it easy finishing up job or two of repairing. Out nowhere unless over to Rose' a minute & she in here about as long. June 24 Pleasant & quite warm this morn - but clouded up & continued rain fell most of P.M. (?) I hadn't much to do about house, so could visit lots with "Mrs Hanscom" who came in the morning & on account of rain is to stop over night with me, guess was over to Rose's two or three times during day, they (?) up house cleaning.